In China, Trump Helped Basketball Stars But Not Human Rights President Trump has returned from his trip to Asia, which included stops in China. NPR's Scott Simon highlights some of the dissidents Trump didn't mention on the trip. President Trump joined Chinese President Xi Jinping at the Great Hall of the People on Nov. 9 in Beijing. The three UCLA basketball players President Trump helped spring from China this week looked shamefaced when they told reporters in Los Angeles that they were guilty of shoplifting sunglasses in China. They added they were grateful to Trump for raising their case with President Xi Jinping. Trump reportedly referred to them as "knuckleheads," which will probably not deter pro teams from one day signing the suspended college basketball stars to big-time contracts. Trump didn't raise human rights with China's leadership. 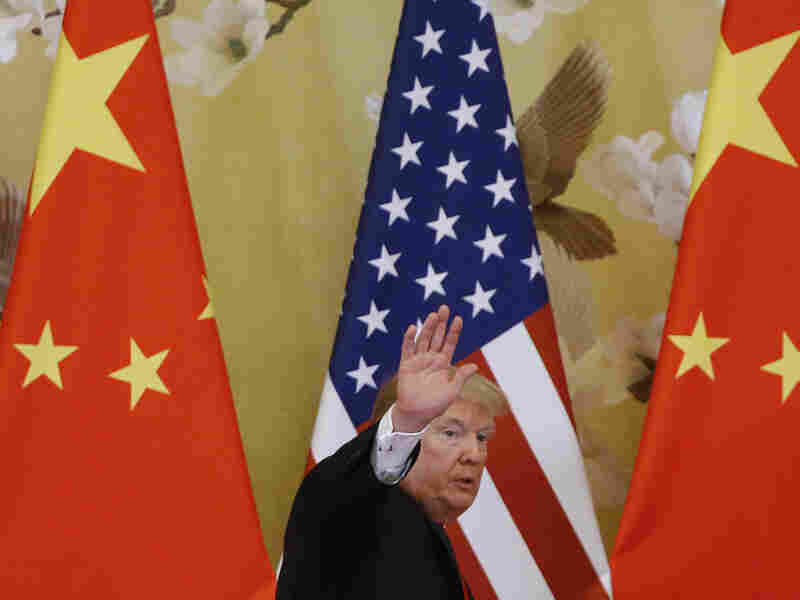 No U.S. president wants human rights to crimp the crucial economic relationship between the United States and China. But Trump wouldn't have had to search far for the names of a few more people for whom he might have asked China's president for a small personal gesture of compassion. There is Guo Quan. You won't find much on him on any search engine in China. The government's response to the Sichuan earthquake in 2008 was one reason that he was moved to speak out against official corruption and authoritarianism. Guo was arrested for "subversion of state power" and has been in prison for nine years. Ilham Tohti is a writer and activist for China's Muslim Uighur minority. He was detained in January 2014 and imprisoned for life after a two-day trial for "separatism." Tohti has won several prestigious human rights awards while in prison, but none of them can award him his freedom. And there is Jiang Yefei, a cartoonist who has drawn barbed portraits of Chinese leadership. He was jailed and tortured in 2008, then fled with his family to Thailand, where the U.N. High Commissioner for Refugees granted him refugee status in 2015. But just days before they were set to move to Canada, officials of the Thai military government arrested Jiang and sent him back to China — and prison. There are thousands of other political prisoners in China for whom Trump might have asked for a gesture of kindness. Amnesty International says another 500,000 people are detained without charge or trial. They can be students, lawyers, bloggers, labor leaders, clergy and workers who joined a march, signed a letter, read a banned book or even just wrote an email that questions their government. You may wonder why Trump didn't also ask Xi for a small act of mercy toward a few of his own country's most courageous citizens.